If you're thinking of planning a Catholic pilgrimage to Europe, then Oberammgau should be at the top of your list. Located in southern Germany in the Bavarian Alps, this small town is home to wood carvings, frescoes on buildings, and a once a decade passion play. Oberammgau is now famous for it's live passion play. The play was first performed in 1634 based on a vow the town's inhabitants made to God. A man had travelled back to Oberammgau for Christmas bringing the bubonic plague with him. The plague began spreading so that many were getting sick and dying. The townspeople vowed to perform the Passion Play every 10 years if God would spare them from the plague. After the vow was made, the deaths as a result of the plague stopped and those who were sick experienced healing. The play is now performed every 10 years with years ending in 0, with the next performance scheduled for 2020. The Passion Play brings the story of Jesus to life and attracts audiences from around the world. It depicts Jesus entering Jerusalem, His death on the cross, and His resurrection. It involves over 2,000 actors, singers, instrumentalists, and technicians who must be residents of Oberammgau to perform. In 2020, the play will be performed from May 16th through October 4th with rehearsals starting in November 2019. In addition to the Passion Play, Oberammgau is known for it's art. 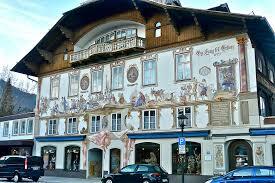 The town has a long tradition of wood carving and is home to the Bavarian State Woodcarving School. In addition to wood carving, the town is also knows for it's frescoes of Bavarian themes, fairy tales, and religious themes on the sides of homes and buildings. 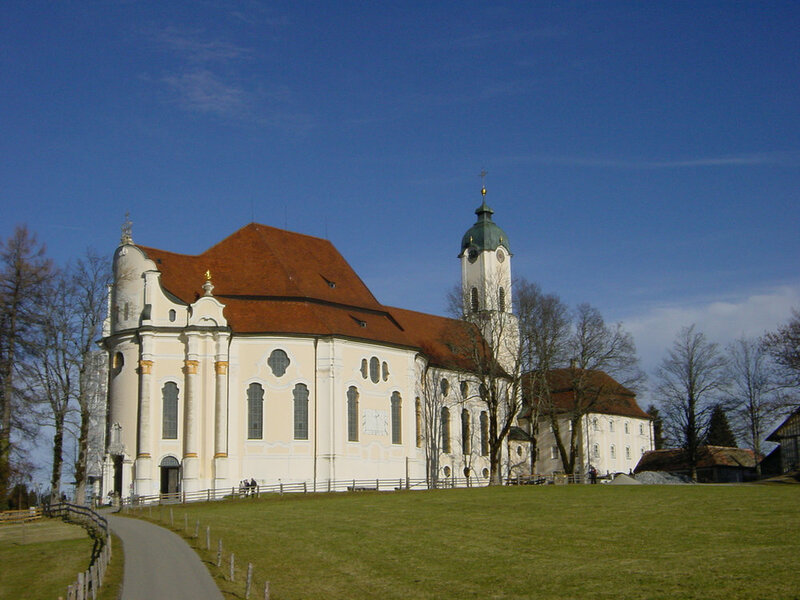 While not in Oberammgau, the Ettal Abbey is located nearby and is a Benedictine monastery and Baroque Church. Today, the Abbey is home to 50 monks. Founded in 1330 by Emperor Ludwig as a response to a vow to God for his safe return from Rome. The 12-sided floor plan (which was rebuilt after a fire in 1744) features stucco and frescoes, including the ceiling fresco of a Benedictine depiction of heaven with the saints and the Holy Trinity. Another well-known pilgrimage stop is Wieskirche, a pilgrim church with interior frescoes. This church is famous for its works from the Rococo renewal of art and architecture. It is also home to the Scourged Savior statue. Local townspeople saw tears in the eyes of this statue in 1738. It has been a popular pilgrimage spot since that time. This church is a functioning church today and tours are only available when there are no services scheduled. Oberammgau sits in the foothills of the Bavarian Alps and is a short distance from Mt Kofel. Many outdoor enthusiasts visit Oberammgau in the summer for hiking and biking, particularly hiking to the top of Mt. Kofel for spectacular views of the valley. For those who prefer to ride, you can take a chairlift to the top to and look down upon Oberammgau and the surrounding countryside. In winter, activities include skiing and horse drawn sleigh rides. Oberammgau is an ideal stop on any Catholic pilgrimage, but will be especially meaningful for pilgrims in 2020. Here at Good Shepherd Travel, we're ready to help you plan your pilgrimage to Oberammgau or other Catholic pilgrimage destinations.